This year has seen two books published from the hand of Bishop Paul Barnett, my predecessor as Bishop of North Sydney and a distinguished lecturer, author and scholar (whose number of publications clearly surpasses that of his successor!). The first was his contribution to the Reading the Bible Today Series with the release of his commentary on Philippians and Philemon. The second is his appreciation of the contribution of the Simon Peter to early Christianity. Bishop Barnett’s mastery of the historical situation of the first century provides an excellent background and interpretive grid for his exploration of the complexity of the apostle Peter, with all his ups and downs: from his coming to full realisation of the identity of Jesus to his rebuking Jesus for contemplating suffering and death; from his betrayal of Jesus during his trial to his leadership of the church on the day of Pentecost. However, the paradox of Peter as Barnett describes it is that, after such a triumphant contribution to the opening pages of Luke’s second account to Theophilus, Peter seems to disappear from view after the Council of Jerusalem (Acts 15) – which raises the question as to what Luke meant when he enigmatically declares that Peter “left for another place” (Acts 12:7). Paul Barnett explores this paradox in great detail and provides a helpful guide to the travels of Peter from Jerusalem, Judea, Galilee and then to Antioch and Corinth, his memoirs as recorded by Mark in the compilation of the second Gospel, his conflict with Paul as recorded in Galatians, his two canonical letters and, finally, his martyrdom in Rome. Helpful dating of each of these events enhances the telling of Peter’s story. Where the evidence is scanty to fill in the gaps, Bishop Barnett is a reliable guide even when speculation is called for in order to make sense of the chronology. I found the book easy to read, engaging and insightful. Bishop Barnett rightly highlights the way in which Jesus was prepared to trust Peter to be the leader of the Twelve, despite his obvious weaknesses. 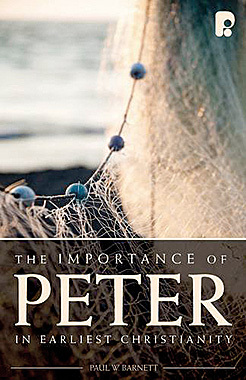 He challenges the reader to reflect upon the change of leadership from Peter to James in Jerusalem and the way in which this apostle to the Jews complements Paul’s apostleship to the Gentiles, providing us with a rich tapestry of the New Testament documents that enables those who read them to “grow in the grace and knowledge of our Lord Jesus Christ. To him be the glory both now and forever more. Amen” (2 Peter 3:18).